Prepare for a fresh new tan! Naked Tan Goddess Body Exfoliator buffs and polishes ..
Professional tanning result at home! Lightweight, velvety Goddess Bronz..
Goddess Creme de la Creme 150ml Creme de la creme... is just that.. made from the fienst ingr..
Professional Tanning result at home! 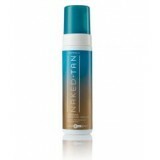 Naked Tan Goddess Gradual Tan moisturises you.. Maintain your tan for longer! If you don’t have time to tan and need an instant gl..
Naked Tan Goddess Body Cleanser is specifically designed to use BEFORE and AFTER a spray tan with..